A few weeks ago, I talked about how we buy goods in this country. 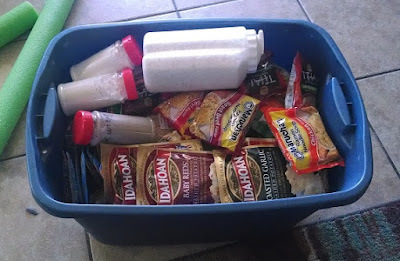 Today, I show you how that consumerism is helpful for thrifty preppers. Now that you have a CA-compliant Modern Sporting Rifle, what do you do next? Before I go too far into this post, I need to mention that the love and attention shown to any of the AR fill-in-the-blank platforms by the State of California applies equally to their ComBloc equivalent, the AK and all of its related variations too! Our esteemed and quite patient Editrix Erin shared a video to my Timeline weeks ago, showing a CA-compliant magazine system. The company that makes this is called CompMag and there is a very good write- on their website. This is a clean and rather elegant answer to the "Fixed Magazine" requirement found in recent CA (and other states) laws. As a southpaw, this is not as convenient for me as some of the systems shown last week, but it's still a contender. "Our new MA-Loader is a California compliant, 10-round bullet loading device that will allow you to safely and efficiently reload your fixed magazine without the need to break down the firearm. Simply place the MA-Loader into your AR-15's ejector port and press the thumb-ring slider to quickly load or reload. It is that simple!" "But what about having to buy multiple MA Loaders?" you ask. Well, I am willing to bet that most people have more than 2 magazines, so purchasing half a dozen of these, while more expensive, is what California residents might have to do. Oh, just for a comparison, 10 round Magpul magazines retail here for $25. Now that there are ways to have a loaded Modern Sporting Rifle, what do you put into it and how do you re-supply yourself? Again, since this is California, the answer is "With some difficulty." Recently passed laws require all ammunition sellers to be registered with the state separately from their firearms licenses. Those forms and what needs to be done are still in flux since this past January. Another problem is there can be no shipments of ammunition into the state to private parties. Ammunition purchases will have a minimum $1 fee at the time of sale for a background check. No ammunition purchased out-of-state may be brought by car into California after January 1. Many stores are refusing to accept ammunition shipments from retailers to private parties, since the paperwork is not finalized. The only bright spot is there is no restriction on reloading supplies. For now. Doesn't all this sound like fun? There are even more private businesses helping the law-abiding citizens of the State of California to follow the rules and regulations! Nothing was purchased this week ... but I will probably get something mentioned either this week or last. All items mentioned can be purchased from various online retailers or in some cases, directly from the manufacturer. Shop around for your best price! Wait, you WANT it to rust? We've been conditioned to view rust as the enemy of all things steel. That's actually pretty good advice, on the whole, but sometimes you can guide rust to actually protect your steel. In those instances, it is called a patina, and a great example of this is the bluing process used on firearms. One of the big weaknesses of many knives, including several varieties of Mora, is that their carbon steel blades are susceptible to rusting. This vulnerability can be exploited to protect the blade and is actually very easy to do. Rust, that uncontrolled red nightmare, is ferric (iron) oxide. When properly controlled, this oxide forms a thin, protective layer on the surface of steel and iron products. It's pretty simple to control this process, and relatively safe, with the side effect of giving your blade a very cool muted gray color. It's also a food-safe finish, keeping all the utility of your knife. There are a variety of techniques to patina a blade. Many involve harsh chemicals, and while they work well, I'd rather avoid those since there is a safer, less costly, and more convenient method using only household products. You simply need a cleaner (rubbing alcohol is the general favorite), an acid (mustard, citrus juices and the like will work, but vinegar is cheap and effective), and a bit of time. There's also this method, which uses hydrogen peroxide as a rust accelerator, promoting a fast, deep patina. It is a bit more involved, but also gives the best results. Choose whichever method you're most comfortable with, and protect your steel. It will serve you well for a lifetime. 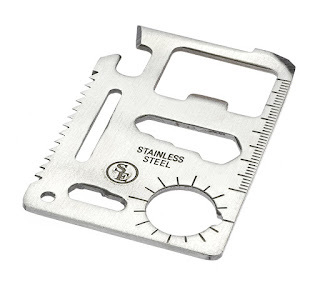 I remember a few years ago when the first “credit card multi-tools” popped up and were very popular for some time. They seemed very useful, but were quite expensive. Since they are a cheap piece of steel with cut outs and laser engraving, the price has dropped considerably with time. Since I thought it looked interesting, I picked up one of the most common designs. I tested the tools on the card fairly heavily. All of them seem to work, albeit not as well as a specialty tool, but well enough for the $4 that I paid. The hex head wrench was surprisingly useful, and worked well, as long as I wore gloves while I used it. The flat head screwdriver also works well, even when it was used on a stubborn bolt, and the bottle opener is very nice when I sit down to drink a Mexican Coke. That alone means that I will continue to carry this with me, unless I am going to be somewhere that objects to the blade on it, like an airport. This is another tool that is cheap enough that if I loan it out, I don’t worry to much. If I decided to get a 20 pack, I could totally see myself giving them out as stocking stuffers. Starting a fire with one should be possible; I just have to figure out the sparking. The biggest issue is with the gripping it while you use it. 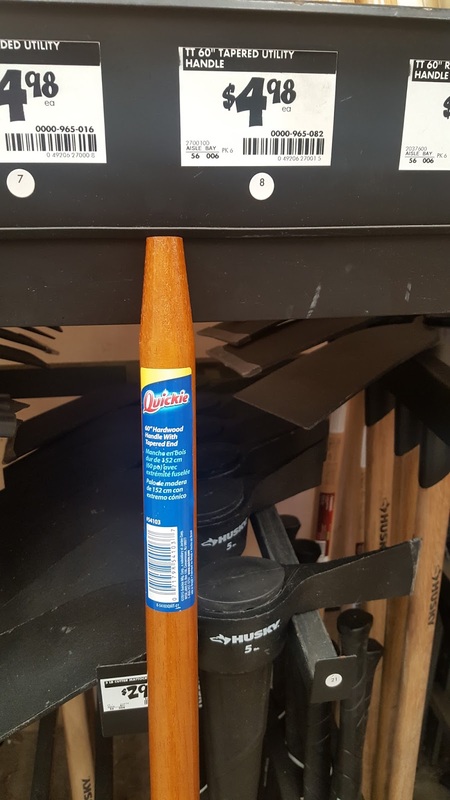 The saw blade edge could in theory be useful, but it is neither large enough to be really useful, nor small enough to be out of the way when you need to use the tool. The map compass is kind of useless. If the tool was clear, I would have no problem with it, but it is to small to be really useful as it is, since I found it difficult to read a map with it as an overlay. The can opener is also hampered by the grip, and compares poorly to my old leatherman can opener on the multitool. 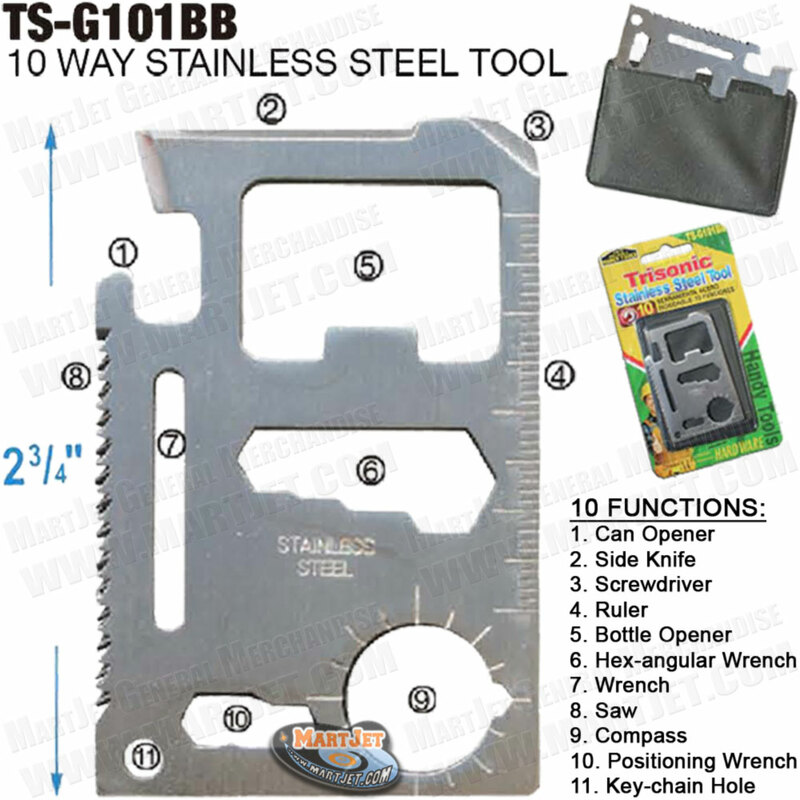 I tried it on a number ten can and several smaller cans, and it was hard to use, since the saw cut into my hand as I tried to use it. The instructions were not very useful. I ended up Googling my questions and found useful diagrams, but I would have preferred good instructions came with it. I would offer a “TSA friendly” version without any sharp edges, so that someone traveling could carry it. This would have the added advantage of being more wallet friendly, since the one I bought has a vinyl sheath that goes over it in order to prevent it from destroying your wallet. I would put a scale on the ruler. I would probably actually add a second one on the other side, so that I would have both inches and centimeters. Some sort of instructions would be nice. I have seen the pre-printed card that comes with most of them, and they really don’t explain much. I would consider a redesign it so that you can wrap paracord around it as an easy storage method. It would no longer fit in a wallet that way, but it would still be an inexpensive addition to a bug out bag. I would love to see a “Fishing Kit” version, designed to aid in hand line fishing. The concept shows a lot of promise, and in specific situations this tool could be useful. This specific card tool seems like it does a lot of things in an okay manner, but none of them really well. In general, though, I recommend a belt multi tool. All that said, if you can find one for cheap, I would pick it up. It is a nice addition (at that price) to an ultra-light bug out bag, or just to carry around with you in your wallet, and can be loaned out with minimal worry. I will be trying out several variants of this in the future, because I feel like this has so much unfulfilled promise. Having been an “accident-prone” child, and then working with my hands for most of my life, I have developed an appreciation for skilled wound closure. My job puts me near a lot of agricultural equipment, which is either designed to be sharp or ends up worn to a razor's edge from use. Once something breaks, it's rarely a smooth break and there are jagged edges of wood and metal that need to be worked around. I don't mind having scars, but if the medic closing a cut knows what they're doing, the scars are much less visible and the wounds heal much quicker. I've had an intern suture up a 2” cut on my knee and when I went back after a week to have the stitches removed, they required a doctor to dig them out with a scalpel. The surgeon who worked on my neck was kind enough to make the incision in an existing fold of skin and used Steri-strips to close it instead of sutures, so the scar is really hard to see. I've seen a friend go through two weeks of IV antibiotics because a surgeon sutured up an incision so sloppily that there was a fold of skin between two stitches, leading to a nasty infection. Natural disasters like tornadoes and hurricanes produce a lot of damage, creating a myriad of ways to get hurt, and simple wounds like cuts and small punctures are common when you work around sharp things. If local medical infrastructure is damaged or destroyed, you may find it handy to know how to close minor wounds on your own. If you run into something that is beyond your abilities you need to find professional help, so know where your limits are and where that help can be found. Suturing is a skill that takes practice, skill, and some training. Luckily, there are resources available to the average person that will allow you to get the practice and training. I am not a doctor, I don't even play one on TV. The following is presented for educational and informative purposes only. I am not responsible for any actions you take, whether you read this or not. Part of raising livestock is learning when you need to call the veterinarian and when you can deal with a problem on your own. Dogs run into sharp things once in a while, and sometimes they get into fights with other animals and get chewed up. Goats are pretty smart and nimble, but I've seen them lose a battle with barbed wire fencing. And any hoofed animal can injure themselves or other animals during the breeding season; those horns and sharp hooves aren't there for decoration. Since veterinarians aren't supposed to work on humans, they aren't as closely regulated as actual physicians. Looking around the Internet, I've found several mentions of things like antibiotics for fish tanks being identical to those requiring a prescription for human use. A lot of other medical gear is available without a medical license if you start your search with “vet supplies”. A quick Amazon search shows several medical school texts covering wound closure, but they run $50-100 apiece. There are some less expensive manuals to teach the basics, like the US Army training manual (Kindle edition only) for $12.00, or a used copy of one of the manuals printed by a suture maker for about $20.00. These will teach you the basic knots and how to choose the proper material and size of suture for differing types of wounds. Once you have something or someone to teach you the knots, you're going to need to practice them. There are rubber practice pads available, but I learned a few simple techniques on a chicken from the grocery store. Buy a whole chicken, or at least a large uncooked piece. A whole chicken will give you lots of room to practice and will help some people get over the squeamish feelings associated with sticking a needle into flesh. Use a sharp knife to cut into it. Practice sewing the cut closed until you're happy with your handiwork. Unless you're using sterile sutures and working on a clean table, I would advise that the test chicken be discarded rather than eaten when you're done. Sutures are readily available at most farm supply stores; look in the veterinarian aisle. If you live in an area without a Tractor Supply, Bomgaar's, FleetFarm, Farm Supply, or Rural King store handy, they all have websites. You can also shop on Amazon, where $20.00 will get you a dozen “training” sutures and three tools for working with them. 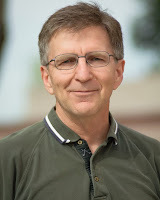 “Training sutures” brings up a good list to choose from and they will deliver just about anywhere. Once upon a time I got a couple hundred “expired” sutures from eBay, but that venue has been over-run with 'bots and scams in recent years. A lot of doctors have recently started using Steri-Strips instead of sutures if a wound is shallow or small. They are easier to apply and don't leave as large a scar, but they have a shorter shelf-life and need closer temperature control for storage. I may have to do some more research into this method, as I've had very limited personal experience with them. Being a prepper means becoming more self-reliant, and being able to patch up minor wounds on your animals is a good way to save the expense of calling a vet. Plus, if you ever get into a situation where you need to close a wound on another person, having the skills and materials at hand could be life-saving. Here at Blue Collar Prepping we do not write on politics or allow others to do the same. This is not a political post, but a theoretical and practical way to make residents of the Great State of California compliant with the LETTER of state law. Very Important! I Am Not A Lawyer! 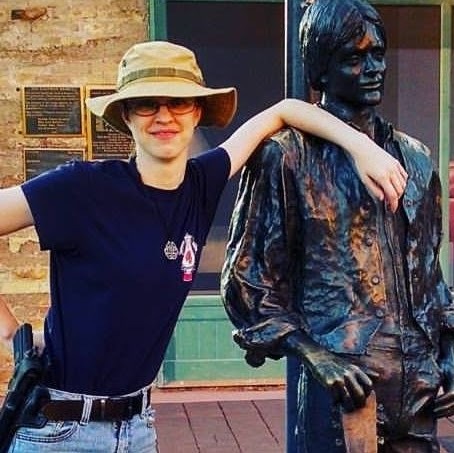 I do not hold a Federal Firearms License! This is in no way intended to be legal advice nor am I recommending a way to bypass your city and state laws. Your local laws may/will vary from mine. California is one of a very small group of states that restrict the features found on Modern Sporting Rifles, and law-abiding citizens of those states need to follow their regulations. To keep from registering a rifle as an "Assault Weapon" in California, certain steps need to be followed and pieces need to be added or removed. To make matters worse, some of the recommended steps appear to be in conflict with each other. Since there is some confusion, I will be ignoring any discussion of meanings and definitions to focus on presenting some of the popular ways of following the current law. 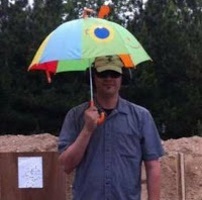 Here is a PDF guide to one company's explanation of what a "featureless" rifle entails. This is what (currently) counts as a "featureless" rifle. There is no adjustable or folding stock, pistol grip, forward vertical grip or flash hider. The picture is of a Thordsen Customs FRS-15 Gen III stock, a popular way to have a detachable magazine on a rifle. 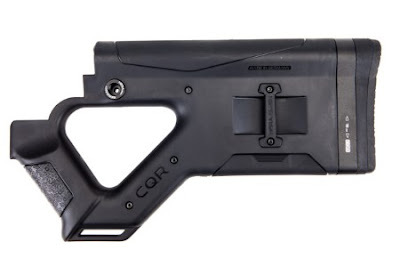 Another take on a "featureless stock" is from Hera Arms, a German manufacturer supplying aftermarket parts to military and civilian customers. To make this particular stock CA legal, the opening needs to be filled in, since it is technically a "thumb-hole stock' currently prohibited. Both of the stocks shown are somewhat adjustable for length of pull by adding and subtracting spacers, available at extra cost. What Is a "Featured Rifle"? 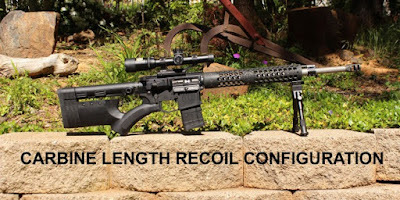 Believe it or not, it is defined as having all the parts most Modern Sporting Rifles have when leaving the factory: an adjustable length stock, pistol grip, forward grip, flash hider and a detachable magazine. So there you have it: two different systems to make your Modern Sporting Rifle legal in CA. Isn't Capitalism wonderful? Here are four private companies making a lot of money selling parts to law-abiding citizens, who are obeying the law! Nothing was purchased by me this week for this post. These companies sell their parts direct and/or through online parts retailers. Check around for the lowest prices. Me on the corner of Winslow AZ. Hooboy, it's been a while since I popped up here. Well, that's life, and despite this blog's tenacity in producing content, our lives tend to get the better of us from time to time and we find ourselves letting go of projects. 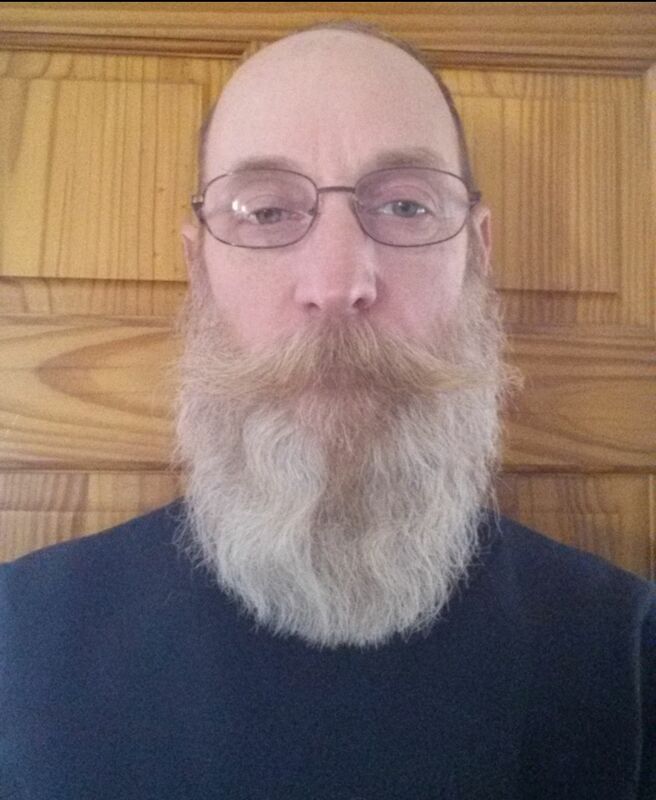 Then there are the times when life is just a series of drudgery and WTFs, and we consume our stocks in whiskey and rum while needing a change. Which leads to the main point of this post: Rhi and Evie are riding again! Yes, OkiRhio and I are once again camping for an entire month, this time in my adopted home state of Arizona. (If you just got a mental image of me rubbing my hands together going "OH BOY OH BOY OH BOY!" you're not too far off the mark.) And if you guys are really lucky, we might even do some videos. I'd actually really like to be able to, but with my husband's PI business taking off here in Arizona, he's got the monopoly on the video camera, so I am probably not going to have the camera by that time (unless people are feeling generous and Erin doesn't roll her eyes TOO hard at me shamelessly plugging the Jade Rose Zen etsy shop). One of my goals for the trip was dehydrating a bunch of food. Unfortunately, I don't have a dehydrator anymore, because the wiring burnt out on the one I had and I haven't been able to replace it. So, I've had to make some sacrifices in terms of type of food. 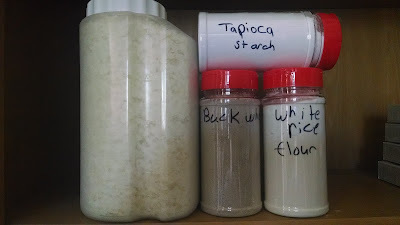 Then it occurred to me that I could make a case for "bugging out" with many of the more common foods that one can find in an American pantry or cupboard. 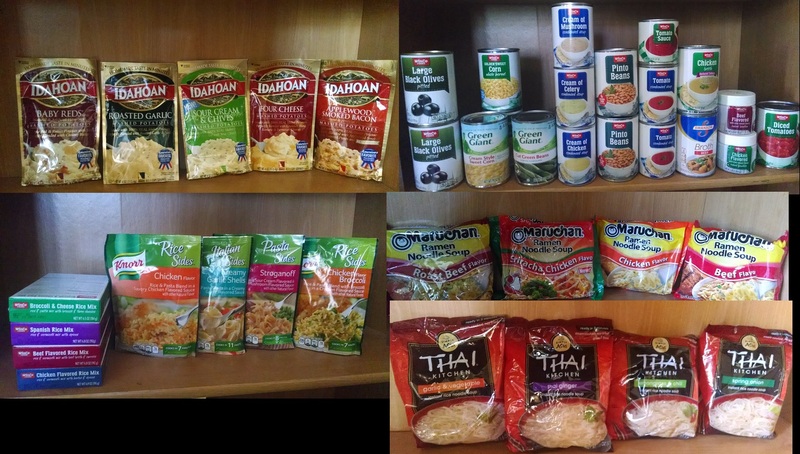 So I pulled together a decent cross-section of such food stocks. The tuna is from the StarKist brand, which in addition to the normal cans also comes in these convenient packs which depending on where you can find them range in 98 cents to a $1.15. The flavors are Ranch, Lemon Pepper and Hickory Smoked, as well as the standard non-seasoned tuna. The advantage of these packs is that they are foil, which means they are lighter than the tin cans and take up much less space in a pack. .. why yes, those are five flavors of instant mashed potatoes there. I was looking over the potatoes and thought of "How about a little variety? They are only about a buck each, and they'll feed at least two people if not three." A healthy pantry filler gets some variety, and I don't know about you, but some of those would make for some great experimental shepherds' pie toppings. 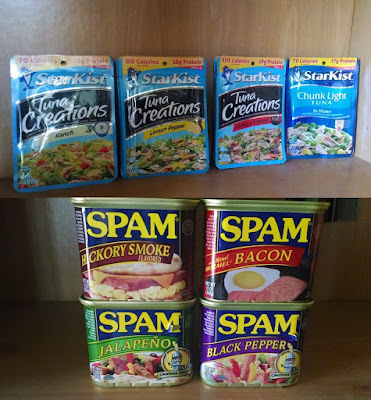 Now if you look at the canned goods, you'll see a good cross-section of what my parents' pantry looked like while I was growing up. (We canned our own green beans and tomatoes, so you can ignore those.) Note that those, plus beef and chicken bullion, are all meal components. I only have around three weeks before the camping trip, and homemade bullion recipes take time that I don't necessarily have. 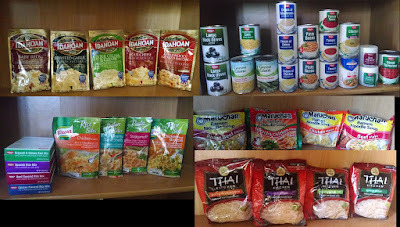 You'll also note there are the cheap boxes of instant rice that have different flavors, and four bags of the Knorr meal sides bags. Those are fairly cheap (about a buck each) additions that you can find at any grocery store, and the mashed potato bags and Knorr side bags are extremely lightweight. And yes, my dear cheapskates, there are indeed Ramen and Thai Rice noodles. The rice there on the bottom right are a bit more expensive - 88 cents per pack -but they are gluten-free and safe for most people who have grain problems to eat. Not pictured is the couple of jars of triple citrus marmalade and canned ground turkey. You can probably guess by now that there will be a lot of combination cooking experimentation that will come out of this trip, and this blog is going to be flooded with recipes for a while. (Seriously guys, we may need to make a cookbook!) It's all going to be based on playing around with common household foods and the cheap stuff. We're also going to be keeping track of our water consumption for this month of camping. 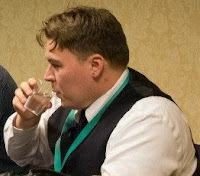 It occurred to me that this could potentially be an incredibly valuable point of data, because much of what we're eating needs water to prepare, and of course we'll be drinking. Plus there's sanitation and its water use to consider! This time, I have the experience from my last trip to help me. It will be easy to to stack firewood on top of this spare tub at night to keep critters out. Plus, instead of a suitcase (that had to have been really well made to withstand being squished by a horse), the clothes are all going to be in a tub as well so that if I need to wash anything, I have a tub to wash them in. I have a much bigger tent this time, and a cot too. The cot was a must as sleeping on the ground for that many nights in a row made my back and hips hurt, and we hadn't even started on the trip on yet. Next time I'm around, I'll be showing you the tent and campsite set-up, along with some of the other additions to the food regime including dried goats milk and cows milk. Yes, fortunately for me my dairy allergy has let up! I can eat cow dairy again, which gives me more camping options. And this is just my side of the preps. Rhi has her stuff she's doing, too. FCC Disclaimer: BCP would like to point out that Evie is NOT sponsored by Winco foods, Maruchan, Knorr, Seakist or Spam. These products were all bought by her and her husband, and are being presented to you on this site because they are inexpensive options. Thank you for understanding. I have been on a “Cheap Tools” kick lately. There are tools that I occasionally need to be able to give away or loan out without knowing if they will come back, but I still need them to do the job if something happens. I have two sisters who would love to be prepared, but have limited time, energy, and budget to research the appropriate tools, and can’t afford the costs of super premium gear. The latest tool that caught my eye is a pocket knife/seat belt cutter/ glass breaker. I feel that the combination of these three items is a good “getting out of a car crash” set of tools, and there is no real advantage to purchasing them separately. I like to carry the Benchmade Triage, but at over $150, it’s a little pricey. Given the people for whom I am purchasing this (my sisters, for example), I don’t expect it to need all of the nicer features that my Benchmade has, or to be as durable. It needs a blade lock, a seat belt cutter, and a glass breaker; beyond that, the rest is basically gravy. 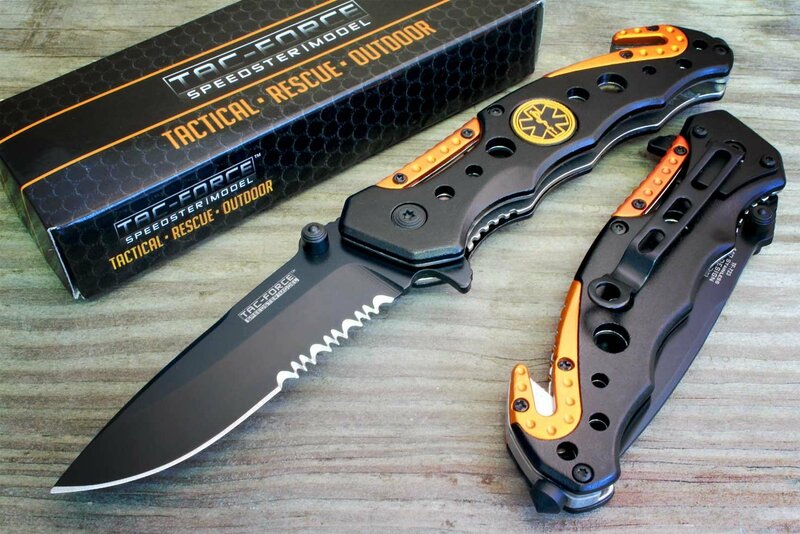 I looked at my various options and decided to purchase the Tac-Force Spring Assist EMT Rescue Knife. As of this moment it costs less than $8 with free shipping for Amazon Prime members and has just under a thousand reviews with a 4.5 star average, so I figured it was worth a gamble. Not as bulky as a lot of the cheap imports that I have toyed with. Spring assist works well. I spent a couple of hours flipping it out and re-folding the blade, in order to see if it would break, and it seems to be fine. Knife cuts well. Not as nice a cut as a high end blade, but just fine for opening boxes or cutting strapping in warehouse work. It also dulls faster than my nicer knives. The price is about the same as a dedicated glass breaker, or a dedicated seat belt cutter, or a dedicated inexpensive pocket knife. For that price point, it seems quite good. Test cuts on nylon strapping shows the seat belt cutter seems to work fine, even if it requires keeping tension on the strapping. Glass breaker works well on scrap (non automotive) glass. I would love to know how well it works as an automotive glass breaker, so if anyone wants to test that and let me know, I would be interested. If weight or bulk is an issue, there are better (if more expensive) options. Ergonomics are not exactly perfect. This is radically better than nothing, but I would much rather have a better handle than this if I ever had to use it for an extended period. The blade lock is a liner lock, and starts out really stiff. It is bad enough that some people with lower hand strength are not able to close it before it is “broken in”, so be aware of that. I recommend opening it and closing it 30-50 times before sticking it in your emergency kit, since that seems to make it easier to use. The quality of build is only so-so. I would not use this as an EDC, because I would not expect it to last longer than a year, or possibly two, in my pocket with regular use. The seat belt cutter is not the pocket knife blade, but is instead a dedicated blade in a covered housing. If you ever need to sharpen it, it appears that you have to disassemble the knife. If you are looking for an inexpensive, functional emergency tool, the Tac-Force EMT Rescue Knife works well. It has no frills, but it does the job. If you have very little budget, and want a reasonable tool, it should work fine. I apologize for not writing a post last week; it was my birthday and I was busy having fun. I suppose I should have had a backup article stashed for use, but I seem to be out of those at the moment. But this combination of forgetfulness and birthdays made me wonder, "What do you do if someone's birthday -- especially a child's -- happens after a disaster?" After all, morale is an important part of survival, and no one wants to feel like they've been robbed of their special day. But after a disaster, you may not have running water or electricity, let alone eggs and flour, so how would you bake a cake? 1) Find a mix that requires as few ingredients as possible. In the past there used to be "Just add water" mixes, but they don't seem to be around any more. The best you'll probably be able to do is find a mix that calls for eggs and oil. You may need to substitute a brownie mix for cake, but unless you're one of those people who doesn't like chocolate or brownies, this isn't a problem. 2) Use a carbonated soft drink instead of eggs and oil. No, really. Convert each egg required by the recipe to 1/4 cup of soda. Using soda makes the brownies more cakelike and less dense than regular brownies. I leave it to the foodies, who will likely have sufficient oil stashed in their pantry, to determine if it mixes well with the soda or not. 3) Cook over hot coals. If you've got a dutch oven you're all set -- if you can bake bread in it, you can bake a cake in it -- but not everyone has one. If not, then you can portion out the mix into camp mugs (like the GSI Outdoors Glacier Stainless Bottle Cup) and cook it over a camp stove or on hot coals next to the campfire. 4) Dress it up a bit. Add some candles, and maybe a little frosting if it's sealed in a can, and you've just made a field-expedient birthday cake. Enjoy! Some ramblings this week about planning, prepping, and doing it in plain sight! 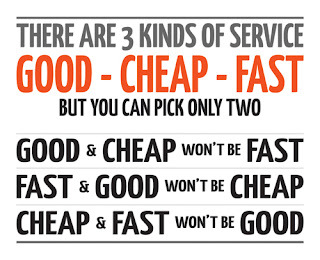 While slightly humorous, this is a reality for most businesses. It also applies to prepping. Fast and good, but not cheap: Think prepackaged MRE's or brand-name freeze dried meals. You can get them delivered within a few days and they'll provide complete nutrition, but you're going to pay for it. Fast and cheap, but not good: Off-brand freeze dried meals and survival bars (like the ones I've reviewed) are fast and cheap, but don't provide everything your body needs. They'll keep you alive for a while, but you can't rely on them long-term. Good and cheap, but not fast: This is the realm of growing your own food. It's much cheaper than buying it from a store and a well-planned garden will keep you alive for a long time, but the results take weeks or months to be realized. Fast and good, but not cheap: The Berkey filters* are great for processing gallons of water every day, to a high standard of purity, but they're expensive. Fast and cheap, but not good: Any chemical treatment like Iodine or Potassium Permanganate can disinfect water in large quantities, but do nothing to remove harmful chemicals. Depending on your source water, you might be able to get by with this route, but I wouldn't count on it for every situation. Good and cheap, but not fast. The Sawyer filters* and Lifestraws* do a good job of cleaning water for you to drink at a small fraction of the cost of a Berkey, but they're slow. 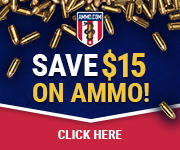 Fast and good, but not cheap: Go to any sporting goods store and buy premium or target ammo. You'll get more consistent groups and have the ammunition on hand, but you'll pay for the extra accuracy and convenience. Fast and cheap, but not good: White-box (commercially reloaded) ammunition or surplus/imported ammunition will be a lot cheaper than target-grade, and you can have it delivered to your door within a few days, but the quality is going to suffer. Corrosive primers and high-temperature powders are commonly used in cheaper ammunition and both can lead to rapid deterioration of a gun's barrel. Consistency and quality control are other areas of concern with bargain ammo, so make sure you're ready to accept more misses and misfires, or at least know what do to when they happen. Good and cheap, but not fast: Reloading your own ammunition is the best way to tailor cartridges for an individual gun, wringing out every bit of accuracy that the combination of shooter and gun can give, but it's slow. The components and basic equipment aren't that expensive, but the set up and load testing time can be a reason to pass on this practice. I could go on for a long time giving examples, but you should have the basic idea. Knives, tents, clothes, cookware, etc. all have the same “two of the three” type of trade-off, so set your goals and then set your priorities. In some cases you may be able to work with something that is a bit cheaper than the top of the line as long as it still meets your base goals. Not every firearm has to shoot 1” groups at 100 yards, not every tent has to be able to handle snow loads, and not every meal has to be tasty as well as perfectly balanced nutritionally. Other times you might be willing to save up for something that costs a bit (or a bunch) more just to get the peace of mind that comes with knowing you got the best thing available. Like everything else in life, prepping is a series of compromises. Know what you're willing to trade in order to get what you need. 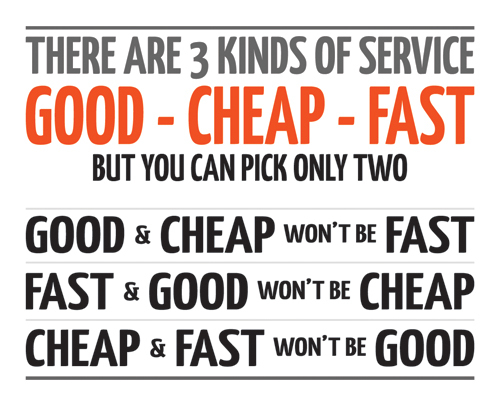 As a side note, I should mention that there are a lot of places that will try to sell you less than “two out of three”. There's a lot of overpriced crap on the market that is neither good, fast, nor cheap, so make sure you do your research and check product reviews found anywhere other than the seller's site. We here at BCP don't normally get test-and-evaluation samples to write our reviews; we buy things with our own money and conduct real-world tests. We are also not afraid to write a negative review if we run into something that is not worth buying (in fact, I believe that some of us actually enjoy being able to point and laugh at some of the poorly made, tasteless, broken, useless junk that is being marketed to preppers). 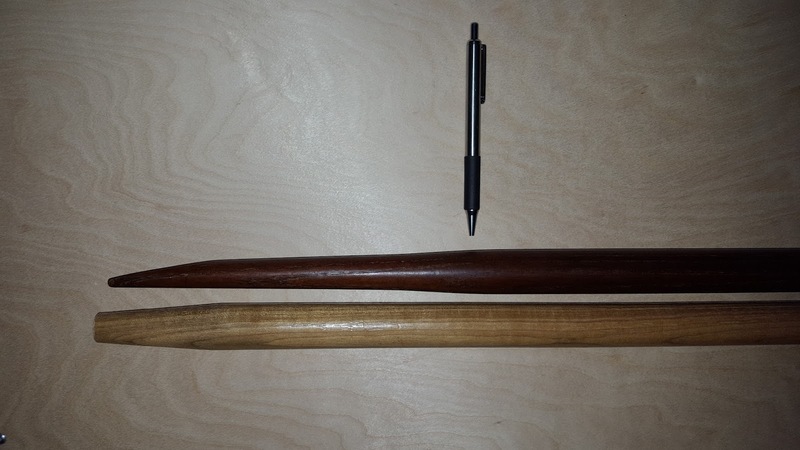 In last week's blog post about finding a combination spear shaft/walking stick, I mentioned wanting to have a durable end for my stick after finishing the spear end. Like most of my plans, this one changed quickly; a local friend read that I was making a walking stick and that the down end would be finished after designing and shaping the spear end. He asked "Why didn't you ask me about making walking sticks? 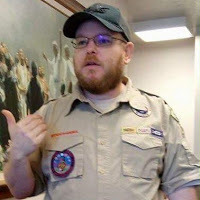 I do them for the Scouts all the time!" So my walking stick is getting finished in exactly the opposite fashion than I expected. Typical. I wanted to use the Lee Valley Staff End marked "F". I like the look of brass, and there was no other reason for choosing it over the stainless steel version marked as "C". "Measuring 1-3/4" long, the largest tip fits shafts with a 1" or larger end diameter and mounts with an included screw. 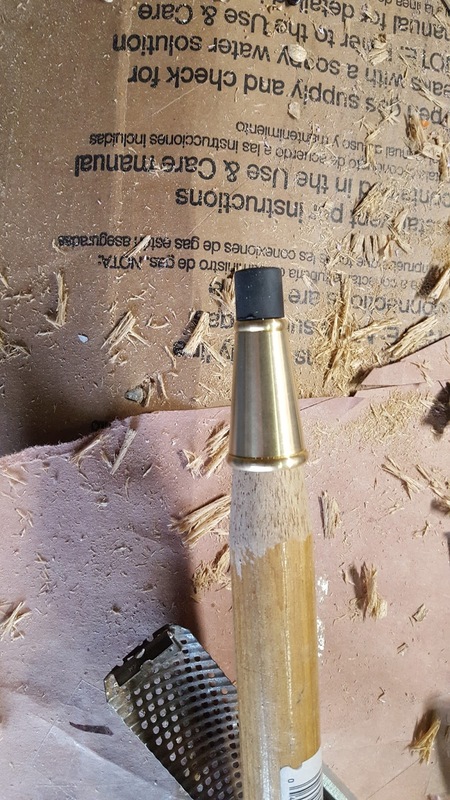 To fit the large cane tip to the shaft, you can shape the shaft end freehand to match the tapered tip socket, or to apply a close-fit taper, you can use our 5/8" Veritas tapered tenon cutter (our #05J61.09)." taper cutter used primarily in chair making to taper legs, arm supports and back spindles. 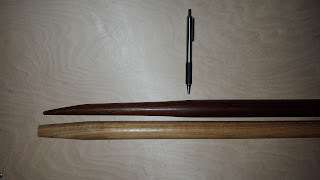 I decided to use the existing tapered end as my starting point, since major wood removal is involved in shaping the pole to accept the spear head. 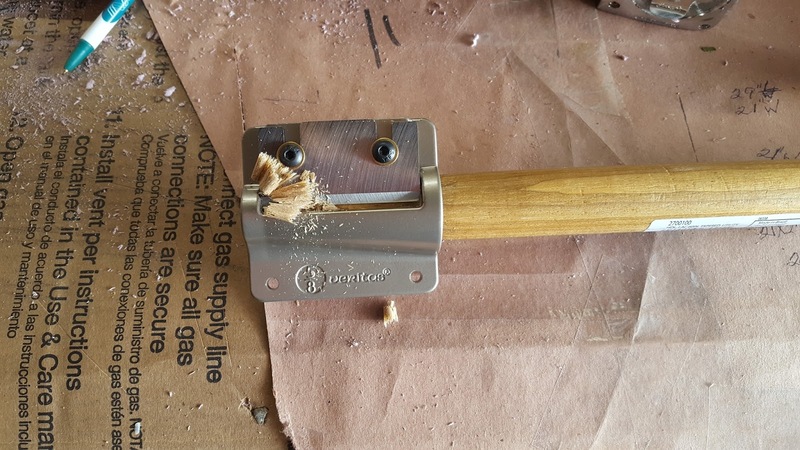 Yes, the tenon cutter works just like the old school pencil sharpeners I had as a child, except this one weighs most of a pound and has a blade that can be resharpened. I originally tried to hold the cutter in one hand and twist the pole in the other to start cutting; this didn't work very well even with a razor-sharp tool, since the wood is very dense. I ended up placing the cutter on the floor between my feet and using both hands on the pole. This allowed me to push as hard as necessary and turn the pole at the same time. It took most of 30 minutes to get the taper cut. Not all of that time was spent cutting, though. Since I'd never used this tool before, I stopped regularly to do test fits on the end and see how well the cutter worked. Interestingly enough, the cutter will NOT stop working when the proper amount of wood has been removed! I did have one small problem with the cutter: the blade was loose when I borrowed it, because my buddy sharpened it before loaning it to me. That is entirely my fault for not checking the tool before use. 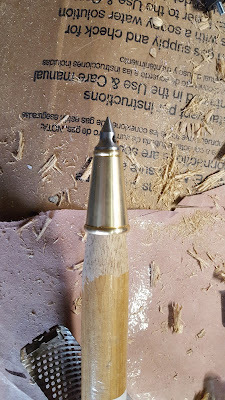 The instructions says to drill a 1/8"dia. hole 1" deep into the center of the pole, so the included screw can hold the staff end onto the pole. 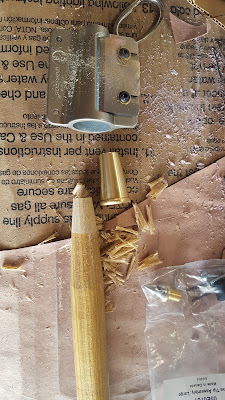 I waited to drill the hole until after shaping the wood in case I had to call a 'Do Over' and chop off part of the taper, which seemed pretty wise when I discovered the loose screws holding the blade down. This wood screw that anchors the cap to the pole takes a #1 Robertson drive (also known a square drive) to install. I think this is used to keep someone from thinking this is a normally removed part. The rubber tip is held on with a machine screw, not a wood screw. The machine screw can be bought at your favorite hardware outlet, but the rubber tips need to be ordered from Lee Valley. The metal spike point threads into the same hole used to mount the rubber tip, but there is an extra step involved to make the spike secure: it has a hole through the base that requires a smaller than 1/8" dia. tool to really wind it down. 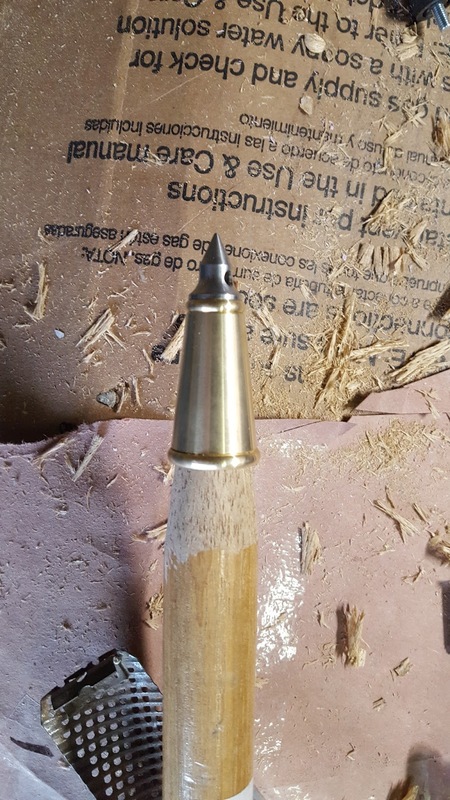 I used what I think was a 2-1/2" 6p finish nail. It is going into a pill bottle, along with all the parts, since I need to strip the existing finish and shape the spear mounting end. In the future, I am buying spare screws, rubber ends and possibly a spare spike, just because! I don't have the funds to buy everything I need, let alone the things I'd like to have; that means I need to ask around more to see who has tools and the expertise to make my jobs easier. Nothing was purchased by me for this project, but I will be replacing my friend's staff end. One Brass Staff End from Lee Valley, $19.50 each. This is not listed on Amazon. If you are really serious about making lots of walking sticks, you could buy the 5/8"Tapered Tenon Cutter, also from Lee Valley for $39.50. Now that we've covered some of the issues with rabbit, here's an example of how they can be so wonderfully tasty. This recipe comes from my favorite wild game cookbook, Dressing and Cooking Wild Game. In addition to being a great cookbook, it is also a primer on how to take animals from furry or feathery to ready-to-cook. In a large plastic food-storage bag, combine 1/3 cup flour, salt, black pepper, and cayenne pepper; shake to mix. Add rabbit pieces; shake to coat. In a large skillet heat 1/4 inch oil over medium-high heat until hot. Add coated meat, browning on all sides. Cook over very low heat until tender, 20 to 25 minutes, turning once. Transfer meat to a plate lined with paper towels. Set aside and keep warm. Discard all but 3 tablespoons oil. Over medium heat, stir flour into reserved oil. Blend in milk or broth. Cook over medium heat, stirring constantly, until thickened and bubbly. Add salt and pepper to taste. Serves 2 or 3. Find a rabbit and give it a whirl. You won't regret it. So you know how many solar panels you want, you know what size your battery bank is, and you know if your installation will be on a house or on an RV. This article assumes that you have purchased the panels and are ready to install them. I will cover the electrical installation and positioning of the panels, not the physical installation. I will cover the basics of installing it on a roof, or atop most RVs, but there are so many options that I cannot cover everything. This is only meant as a basic guide. I do not know what your specific situation is, and I am not an electrician. Have things double checked, and don't burn your house down. This is not instruction for a “grid tie” system that will connect to the normal household power and to your municipal power. Those are much more complex, and much more difficult, and involve your breaker/fuse box. This is meant for a stand-alone system that does not connect to your normal household power, and instead only connects to a battery bank. If you want to do a grid tie system, you must do a lot of research that is beyond the scope of this article, and please seriously consider hiring a professional. Install the panel flat on the top of the RV. I do not recommend installing it at an angle to the roof of the RV, since it will catch air as you drive. Don't install it next to any tall protruding objects on the roof, since those can block the sun from reaching the panels. I recommend that you place the panel so that it has the shortest distance to your battery bank. Place it so that the sun will not be blocked by anything on the roof (chimney, swamp cooler, etc.) and so that it will get the sun for the longest period of time during the day. I recommend south facing as a rule, unless you have something that will block the sun from that direction, such a neighbor with tall home, or an inconveniently placed mountain. I recommend that you put the panel in at an angle to the ground, usually around 45 degrees in the US. There are all sorts of calculators online for the optimum angle, but for the majority of the continental US, it will not make a notable difference. The exception to this is areas with severe wind, because it may rip the solar panel off of the roof if it is at an angle. Once you have decided on a place to install the solar panels, purchase brackets. 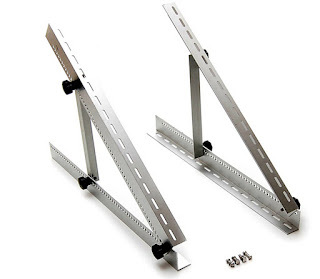 If you are going to install them flush with the surface that they are going on, I recommend these. You may also wish to purchase some roof sealant, to waterproof and weatherproof fittings. The brackets should include installation instructions for the specific model. Most of them require a drill, a hammer, a tape measure, a marking pencil, drill bits and driver bits. You will drill into the surface and attach the specific bracket. Be very careful with this step. If any wire is frayed, damaged etc, you may need to replace it. TURN ANYTHING OFF IF YOU ARE WORKING ON IT. This is dangerous, and don’t do this with live wires. Red is positive, black is negative. Remember to use appropriately colored wires as you continue the run. If you are installing multiple panels, connect the wires before they get to the charge controller. Match red wires with red, and black with black. DO NOT mix the red and the black wires. If you have to run the wires along the inside (or outside) of the structure, make sure to use appropriate fasteners. I recommend using regular cable ties to keep things neat. When connecting wires, make sure to use water proof crimp style connectors, such as this or this. The longer the wires have to go to get to the charge controller, the more power will be lost to something called voltage drop, which means the electricity will become heat instead of filling your battery bank. There are charts on how to calculate voltage drop online. If you properly size your wire, and keep your runs short, you should be fine. Run the wires through a rubber grommet and seal it with silicone sealant. Make sure that the grommet is placed underneath one of the solar panels to minimize exposure to the weather. Be very sure of your placement for your hole before you cut it. If you have concerns, get a roofing contractor to make the hole and install the grommet to ensure that you will not damage the roof. Connect the wires to the charge controller that you have purchased for the battery bank. (We covered what a charge controller is in this article). Make sure to connect red to positive etc. The charge controller should have connectors coming out of it to go to the batteries. Make sure to follow the installation instructions for the charge controller. Congratulations, you have installed solar panels! Remember to practice, and don’t lick the wires. Rabbits are one of my favorite game animals to hunt. They're tasty and plentiful, the season is long, and the license is cheap. They're so very easy to raise that many people keep them as domestic livestock, especially in suburban areas. While rabbits are in fact a wonderful source of lean protein, there are a couple issues to be aware of before you incorporate them into your diet. Tularemia presents with a very high fever, as well as ulcers or lesions. While it can be treated with antibiotics, it can also be life-threatening. The disease is not carried nor transmitted by domestic rabbits, so livestock animals are safe. Wear long pants and long sleeves in the woods. Wear latex or nitrile gloves while field dressing rabbits (or any other game animal, for that matter). My best advice for rabbit hunters is to wait until after the first hard freeze of the season. A couple days of freezing temperatures will kill sick animals, as well as the bacteria itself. The other concern with adding rabbit to your diet is protein poisoning, also known as "rabbit starvation." I mentioned earlier that rabbit was a lean protein; in fact, it's so lean that you can actually suffer starvation symptoms while gorged on it. Rabbit has roughly 8% fat, as opposed to beef at better than 30%. Any large quantity of rabbit in your diet has to be supplemented by some kind of fat, either in the cooking (oil or butter, for example) or in the rest of the meal (nuts, avocado, and other fatty foods). The danger is so real that the US Army Arctic training unit recommends eating nothing instead of rabbit if rabbit is the sole food available. With these concerns in mind, rabbit is a wonderful meat. If you have the space and the inclination, they're awesome livestock. They breed prolifically and at a young age, so they're fairly easy to build a stock of. If you have access to wilderness, you likely have rabbits that can be hunted, and they're a wonderful introduction to hunting and a great way to hone your skills. Our esteemed editrix Erin has made a habit of gifting seriously interesting, awesome and cool gifts to our group of co-bloggers. In a long list of gifts, she gave me the Assegai spear reviewed in this post. Further along in the article I mentioned wanting a combination walking stick and spear shaft. I think I found the answer to that problem. I'm in a Big Box store every day, and while cutting through the Garden Department, I saw this nifty item on the rack. This particular wood pole is listed as 'Brazilian Hardwood', which is not one particular type but rather one of 5 different woods. It doesn't particularly matter to me, since this is to be a semi-disposable walking stick and spear shaft. Besides, the price is right for this project. If something goes wrong, I'm only out a couple cups of coffee for the first one and its replacement! The pole is finished with a very thin coat of a semi-gloss clear, which will be completely removed and the wood treated with a penetrating exterior rated sealer. The taper starts right at the spot indicated by my pen and finishes with a steep angle that flows into the back of the spear head. (Unfortunately, I can't take a picture with my phone that shows the taper gong into the head.) From looking at the original handle and how it matches up with the spear head, the taper does not need to be started as far back as shown to fit into the blade socket. I originally wanted to have the tapered end also be the "Down" end of my walking stick, but after seeing the actual spear shaft shape, there is no way for it to be anything but up. That means I still need to figure out something for the bottom of the staff, to make it a better all-around stick and not just a spear handle. To be that versatile, something needs to go on the end. I'm looking hard at these Staff Ends from Lee Valley. I'm thinking of buying is the "F" end set, which gives the option of a rubber tip or a replaceable steel spike point when out in the woods. This is still in the theory and planning stage, since the spear end is the first project. Keep your eyes open! There are bargains and surprising finds everywhere, like a solid stick ready to be made into my staff/spear handle combo! Making a dual purpose item makes me feel better. The “important” people who live on the east and west coasts of the USA like to refer to the rest of the country as “flyover country”, because the only time they see it is when they fly over it while traveling from one coast to the other. That's not the kind of flyover I'm going to write about. One of the common tropes of prepping and survivalism is the concept of hunting for your food after a major disaster. 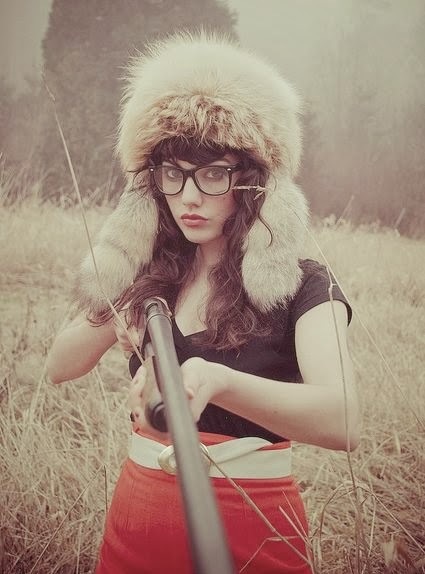 Some people think that they will be able to “live off the land” like the settlers did a couple of hundred years ago, while other people point out that everyone and their cousin is going to be out there shooting at Bambi at the same time, potentially leading to the decimation of all wildlife within a few hours' drive of any city. While I personally wouldn't mind seeing fewer deer on the roads (they kill about 200 people every year), I'd hate to see them exterminated. There are also other sources of protein worth hunting, if you know where and when to look for them. Living not far from the Missouri River, I get to witness the annual migrations (spring and fall) of large numbers of geese and ducks. 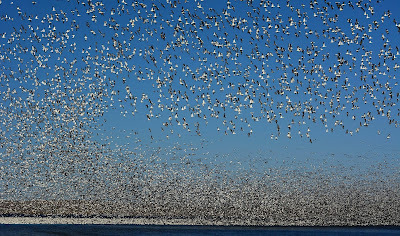 Large numbers means that I can walk about three miles and find 600-800 thousand Canada and Snow geese in one area. Yes, over half a million geese at any given time stop here to rest for a few day on their travels between nesting areas in Canada and wintering areas in Mexico. This happens every year and lasts for about a month each spring and fall, and has been happening for longer than people have lived here. 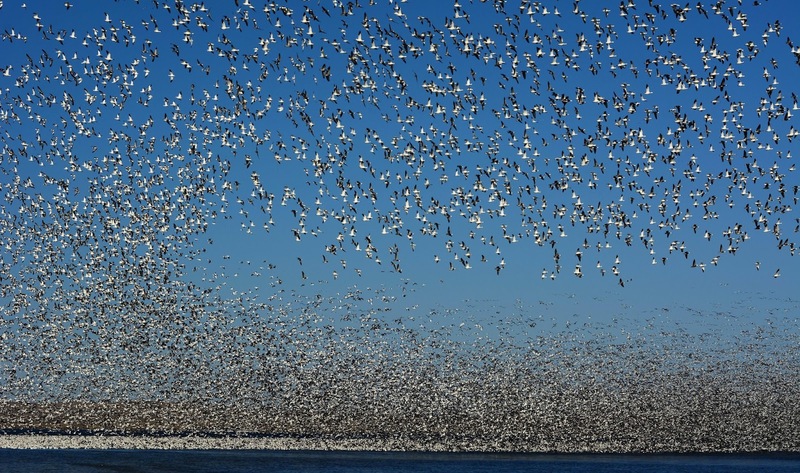 Short of a nuclear war or asteroid strike, no disaster is going to disrupt the migratory patterns of waterfowl; it's literally hard-wired into their brains. Here's a picture to give you an idea of what a field near any source of water around here looks like right now. I drove past several fields like this today. Twice a year, for about a month each, nature brings the game to us. In the fall it provides a good way to stock up for the winter months, and in spring it provides a much-needed change of taste from eating stored food. You don't have to be a hunter to get a meal out of something like that. I've seen idiots ticketed and fined for walking into a field at night armed with nothing more than a golf club, looking for a way to fill their freezers without jumping through the legal hoops (or they're prohibited from owning firearms). I have friends who do hunt legally with shotguns and decoys that can fill a pickup bed with birds in a day; if you get enough hunters together, the daily limits stack up. 30 years ago we had a rare spring tornado (or microburst) hit a migrating flock in central Nebraska in March. Driving down the Interstate was bizarre, seeing dead Snow geese scattered along the shoulders and in the ditches for miles. Other than waterfowl, there are dozens of other species of birds that migrate every spring and fall. Who hasn't looked for the first robin as a sure sign that spring has arrived? The Swallows of Capistrano are a West Coast phenomenon, but every region has something similar, even if it's just blackbirds or sparrows. Smaller birds in smaller numbers may mean you'll have to modify your hunting strategy, but food is food. Ducks and geese typically require fairly large shot to kill reliably: No. 2 through BB-sized back when we could use lead shot, and BBB or T sizes when using steel or other non-toxic shot. Smaller birds can and should be taken with smaller shot, all the way down to No. 7 ½ or No. 8 for any bird smaller than your fist. I live on the edge of what is called the Central Flyway, which covers about half of the continental US and is used mostly by snow and Canada geese. A few hours west of here, the sandhill cranes make the news every year as they pass through. While it's illegal to hunt sandhills in the US (endangered species), Mexico has no such restriction and I understand that they are quite tasty. The variety of ducks has decreased in my lifetime, but we still see mallards, canvasback, wood ducks, teal, and ringtails come through in moderate numbers. Some of these birds stick around to form resident flocks over the summer, but most keep going further north. Modern farming techniques have reduced the amount of “wasted” ground that a lot of the migrating birds relied upon, but we're starting to see some of the marginal and poor-producing ground go back to grass and native species. The various government programs called Cropland Reduction Programs (CRP), and the slim profit margins of growing corn and beans around here, have restored some of the ground that migrating species need for foraging. Ducks Unlimited and a few other conservation groups are improving and recreating wetlands to make the flyways better for the birds, so keep an eye open for possible minor changes in migration patterns. The Mississippi Flyway is the other major route for birds headed north every spring in “flyover” country, and from my experience is used by more ducks than geese. It starts on the other side of the state and I don't travel that way very often any more. The Atlantic and Pacific Flyways have their own populations of waterfowl, but I have not spent enough time in either region to get to know them. Perhaps some of our readers can fill in the gaps in my knowledge and help educate us all? Get to know your area and the resources it offers. I know a lot of my friends shake their heads when they hear about the weather I live with up here -- below zero in the winter and over 100° F in the summer -- but there are so many other things around here that it all evens out. I'll take the snow, because that means that I have very few venomous snakes to deal with. I'll live through the heat, because that means that we can grow a wide variety of crops up here. 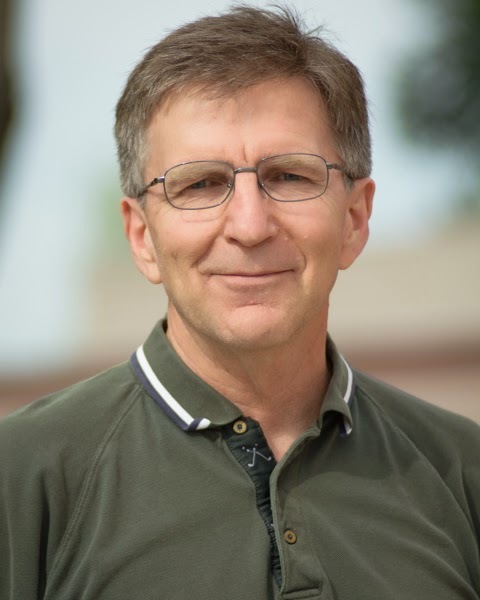 I'm content where I am because I know the region and what it has to offer, but I realize that other people have other priorities and desires so they may be happier elsewhere.